Ah! Sleevenotes! 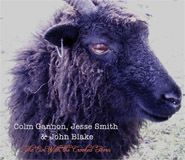 Before this fine new collection of tunes from Colm Gannon, Jesse Smith and John Blake made it to the CD player, my appetite was whetted by the discussion of the sources via which they'd come by their material. Players from the 'Golden Age' of the 20s and 30s are namechecked time and again. The influence of these old masters continues to be felt; however unlike, say, David Munnelly or At The Racket to name just two, whose homages to the golden era are quite literal (and there's damn all wrong with that! ), Gannon, Smith and Blake use their sources as foundations on which they layer their own powerful, passionate and utterly sensitive approach to the tunes. Indeed, power, passion and sensitivity are the watchwords on this album. Gannon's ornate, yet driving box dovetails beautifully with Smith's fiddling which is at once intricate and immediate. As you'd expect, John Blake provides the usual rock-steady accompaniment on guitar and piano. When he picks up the flute, from time to time, we're reminded that Blake is as handy with the melody as with backing. Mighty tunes, mightily played, abound. From the opening reel – McGreevey's, an unusual but contagious version of the popular Speed The Plough – through to the closing Down Through The Broom, taking in jigs, reels, flings and hornpipes en route, this is a musical tour de force not to be missed. As they close their sleeve notes, the lads say “Hope you enjoy”. Well, there's one wish that has certainly come true. For more information please go to http://www.smithandgannon.com (at the time of writing the site is not yet fully up and running, but keep an eye out for “go live”). Old Stack Of Wheat/Johnny Will You Marry Me? Good quality Irish Traditional Music releases are thankfully readily available these days. Great ones are rare and, The Ewe with the Crooked Horn, is one of them. Three gifted musicians, Colm Gannon, Jesse Smith and John Blake have already secured distinctions in the higher echelons of traditional musicians. Smith and Gannon were born into the rarefied, purest environment of Irish American music, while Blake’s original influences were originally nurtured in London, a city which did so much to cultivate our music and musicians at a time when it was all under threat back in Ireland. This recording draws heavily on old manuscripts and 78 recordings, which had been faithfully studied and judiciously selected by these musicians. The comprehensive sleeve notes locate each tune with some of the great masters of bygone eras. While there are some easily recognised old favourites here, there’s also a heavy sprinkling of gems that most musicians may never have heard. That makes it a treasure trove. The beauty of the album is the immersion of musicians, instruments and tunes to produce music that just gets better on each listening. There is no noise here, just fiddle, accordian and flute, wrapped in a light coating of tasteful piano and guitar. Visit http://www.myspace.com/jessesmithandcolmgannon, sample a few of the tracks (the incredible version of the Kesh Jig is worth it alone) and see if you can resist buying it. February 2010 release of Irish traditional music on accordion, fiddle and flute of a variety which has a timeless attribute, leaving you with a feeling as if you have just witnessed a session involving musicians of another, era, another time. The atmosphere is rich, the pace is special with a feeling of musicians who are beautifully connected with each others playing. American born and bred, now living in Ireland, Colm Gannon and Jesse Smith were reared on the Irish music of Boston and Chicago but they also bring the wider musical awareness of the modern generation to bear on this CD. Not that there’s any dilution or compromise of the pure drop here: this is old style music, played by musicians who are familiar with modern artists from Moving Hearts to Martin Hayes, and who still stick with the Irish American classics of a century ago, adding a contemporary touch here and there. Colm’s button box and Jesse’s fiddle are backed by John Blake on guitar and piano: John learnt his music in the broad church of the 1980’s London scene, and can turn his hand to most accompaniment styles, as well as firing up the old flute for a few tunes. The sleeve notes read like a who’s who of Irish music. Give us Another is credited to John McFadden, My Former Wife to piper Bernard Delaney, and many tunes were learnt from the almost holy trinity of Coleman, Morrison and Killoran who recorded in America in the early twentieth century. Whilst this collection concentrates on reels and jigs, there is a set of sweetly turned hornpipes including the title tune, and two track of flings: The Old Stack of Wheat, Johnny Will You Marry Me, and The Four Courts which comes from Frank Quinn’s eccentric version. As Tommy Keane puts it, “the myriad of sources quoted by them for the music they have presented on this recording indicates a common and original journey of searching, listening and learning”, in other words, Colm and Jesse have certainly done their homework! Speed the Plough, The Connemara Stockings, Drimroe Cross, The Boy on the Hilltop, Dunboyne Straw Plaiters, The Killavil Reel: old recordings are re-awakened on this CD, some from long deep slumbers. The only two recent compositions here are Burnt Cabbage and Richard Dwyer’s Jig, both with an old-fashioned dark side to their minor melodies. Apart from one or two solos, box and fiddle duet throughout and at times their tightness and empathy is outstanding. The melody constantly demands your attention, and its raw intensity can be quite overpowering, John Blake’s accompaniment always keeps a respectful distance and concentrates on enhancing the tunes, perfectly fulfilling its side of the Irish musical bargain. On this evidence, old style Irish music is alive and well on both shores of the Atlantic, at least in the hands of Gannon and Smith. Two Irish-Americans and a London Irishman, all now resident in Ireland for over a decade, bring out this excellent collection of Irish dance tunes from a wide variety of sources. Careful choice of material and attention to variations in instrumentation, rhythm and tonal colour combine to sustain interest in a carefully researched programme. Colm and Jessie have played together since boyhood and it still possible to hear a strong Irish-American influence in their playing; indeed it is the distinctive sound of those classic Sligo/New York recordings of Coleman, Killoran and Morrison that remain at the root of their sound. The once dominant influence of those American 78s has slipped in Irish playing in recent times, so to hear it revived here with a more modern sense of swing is really refreshing. There has been an on-going debate about the role of the piano in Irish traditional music, with its supporters pointing to the superbly sensitive playing of the likes of Charlie Lennon as an indicator of its suitability. John Blake’s playing can now be added to the arguments in favour of the piano. He is subtle yet driving, provides adventurous chording yet leaves plenty of space for the melody to come through. Sometimes he switches to guitar or double-tracks some punchy flute playing. Colm sometimes plays a modern melodeon but elsewhere he also an old Paolo Soprani accordion, and it’s not just the instrument that makes his sound rather like Joe Cooley, particularly on ‘The Four Courts’. Jesse is a fine fiddle player and the lifetime of playing with Colm can be heard in the tightness and instinctive understanding they have in playing together. Presenting traditional music and dance of the highest quality, the Washington, D.C., Irish Folk Festival abruptly ended in 2000 and thereby fell one year shy of hitting its silver anniversary. For at least 15 years I was one of the festival emcees: initially at Glen Echo Park in Glen Echo, Md., then at Wolf Trap in Vienna, Va., and finally at the Montgomery County Fairgrounds in Gaithersburg, Md. Among the countless Irish Folk Festival highlights I witnessed firsthand were button accordionist Joe Derrane's unforgettable 1994 comeback on the button accordion and the 1995 performances of a then-unnamed band comprising Seamus Egan, Karan Casey, John Williams, Winifred Horan, and John Doyle, soon to be called Solas. Legendary or prominent musicians such as those were the main attractions of the festival, but one of its most laudable and important traditions in tradition was its "Next Generation" showcase for young players of promise. They included fiddlers Brendan Callahan, Jim Eagan, Rosie Shipley, and Pat Mangan, flute and whistle players Matthew and Aaron Olwell, pianist Matt Mulqueen, uilleann piper Eliot Grasso, and button accordionist Dan Gurney. Two other young musicians of "Next Generation" talent at the Irish Folk Festival were Baltimore resident fiddler Jesse Smith, son of former Cherish the Ladies pianist Donna Long and a pupil of fiddler Brendan Mulvihill, and Dorchester, Mass.-born button accordionist Colm Gannon, who was taught by his Connemara father, John, and brother, Sean. I recall seeing Smith and Gannon perform impressively at the 1995 Irish Folk Festival in Wolf Trap with fiddler Tina Lech and pianist Donna Long. Three years later, Smith and Gannon immigrated to Ireland, initially settling in Ennis, Clare, where they met John Blake, a gifted guitar, piano, and flute player who had emigrated in 1998 from a different Irish diaspora, London. The musical connection made by the three in Clare has endured, even through years when Smith was a member of Danu, Blake was a member of Teada, and Gannon was a member of "Riverdance." Ethnomusicologists refer to a "paradox of the periphery," in which immigrant musicians fiercely defend the musical repertoire and style of their homeland against the encroachments of a foreign, sometimes indifferent or even hostile culture. On "The Ewe with the Crooked Horn," their first, full-fledged album as a trio, Gannon, Smith, and Blake in Ireland proudly plumb the best of the diasporic traditions they were weaned on. That's unusual, and it serves as a splendid reminder that highly accomplished Irish traditional music resists geographic confinement. As was the case with last year's magnificent "Pride of New York" recording by Joanie Madden, Brian Conway, Billy McComiskey, and Brendan Dolan, "The Ewe with the Crooked Horn" respects the past without becoming enslaved by it. The opening medley of reels, "McGreevy's (Speed the Plough) / The Silvermines," immediately sets the tone for the entire album. Gannon's accordion, Smith's fiddle, and Blake's piano drive rather than dash, maintaining an ideal tempo full of nimbly integrated embellishments. The trio conjure up a sea of ceili dancers swirling to their music, yet the precision and lift in their playing also suggest a concert performance of vaulting achievement. Finding the elusive, comfortable seam in performance between stage and dance floor is not easy, yet Gannon, Smith, and Blake have done exactly that. Box and fiddle expertly carry the jig "I'm a Man in Myself Like Oliver's Bull" before the guitar enters for a spirited three-way rendition of "Drimroe Cross." In the reels "O'Keefe's / Boy on the Hilltop," Blake doubles on flute and piano, with Smith's fiddle shadowing the melodic line. The track is unobtrusive and natural in effect, embodying the CD insert's apt epigram: "Play the music, not the instrument." The sole solo on the album is Gannon's melodeon playing of the fling "The Four Courts," backed by Blake on piano. At times Gannon's use of triplets recalls the unsurpassed dexterity of fellow Boston accordionist Joe Derrane's triplets. It's also rewarding to compare Derrane's interpretation of the reel "Give Us Another" on his album of the same title with the interpretation given that reel by Gannon, Smith, and Blake, who follow it flawlessly with "The Stone in the Field." On an album where all 16 tracks deliver lasting listening pleasure, the medley of the jigs "Strike the Gay Harp / My Former Wife" is the longest in duration (4:29) and the most irresistible. Accordion, fiddle, and piano seem to take wing, rising to a level of freedom, confidence, and control held in perfect equilibrium. It is a gooseflesh-raising performance by the trio. The blend of box, fiddle, flute, piano, and guitar from these three musicians beautifully evokes their mentors, past masters, and past recordings. Because the melodies are principally played by Gannon and Smith, the album is redolent more of an Irish-American than Anglo-Irish traditional sound. However it is labeled, the music on this CD unfailingly provides pure-drop joy bordering on the sublime. Even a few, small, recording studio imperfections seem to strengthen the unstilted impact of the performances. 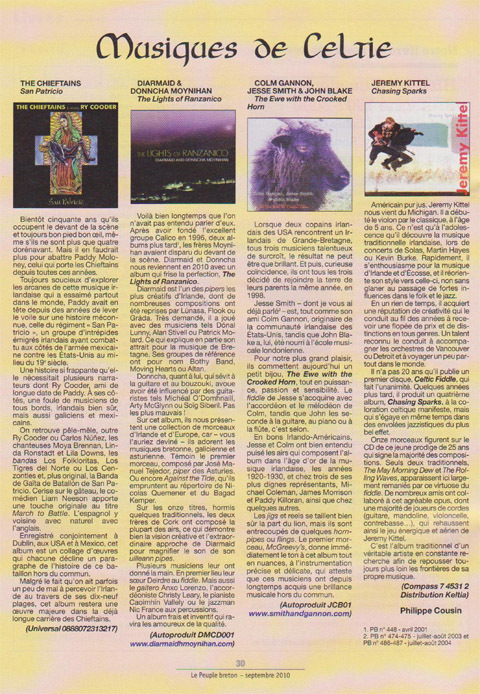 "The Ewe with the Crooked Horn" is a diasporic diamond, burnished by the exceptional skill and care of three master musicians who should inspire a new "Next Generation" of promising young trad players in and out of Ireland. This self-issued album (JCB 01) is available at www.smithandgannon.com. Two Americans and an Englishman get together to play some outstanding Irish traditional music. Well, it’s not quite as straightforward as that; all three come from emigrant families that have maintained a strong connection with the Irish tradition which helps to explain the convincing power of this music. Colm plays accordion and melodeon and Jesse the fiddle and they both sound as though they have listened extensively to the recorded masters of the old American/Irish musicians that were such a strong influence on the playing of Irish music in the interwar years. John accompanies some tunes on guitar but he also joins the melody line at times to play some driving tunes on the flute. Best of all, however, is the way that he augments the melody playing with some outstanding and adventurous piano accompaniments. Arguments rage about whether the piano has a place in Irish traditional music; John’s lovely playing reinforces the opinion that the piano has a role in this music.